HUGE opportunity? That happened to us 5 weeks ago on July 28...and it's something I will never forget. We were at the Farmer's Market in downtown Tracy, CA to share the Gospel as we have been for about a year now. While we have setup our Prayer Stand and had countless opportunities to share the Gospel 1-2-1, I haven't open-air preached since we moved here in June of 2017. I wanted to gauge the waters and feel of our community to figure out what type of opposition (from locals or law enforcement) we might encounter. I determined that July 28th would be the day we started preaching. With the Prayer Stand setup and several of my other kids handing out tracts I setup the speaker and then put the wireless mic on my 3rd oldest son, Solomon. He had been asking to read Scripture aloud for some time and I thought I would let him do so and I would preach from the passage he read. 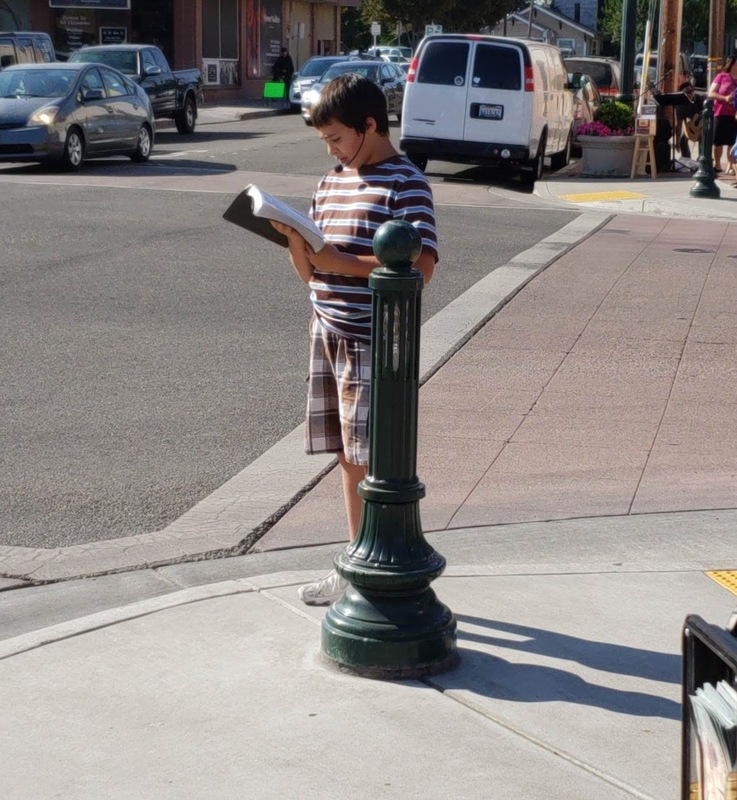 He read through a portion of John 1 and several people stopped to listen. Some of the locals took video and pictures as I watched like a hawk for any potential problems. Once he was done reading I took the mic and preached through the passage briefly while presenting the Gospel and the call to repentance. We had a few good conversations that followed. About an hour or so later Solomon wanted to read again. He decided to pick up where he left off and read the rest of John 1. Within a few seconds of him reading I saw a gentleman wearing a "Ya'll need Jesus" shirt coming towards us with several others. He asked me if he could record Solomon reading and I agreed. This man held up his phone and started live streaming to Facebook. "You're about to be famous little man", was something he said that caught my attention. Was this someone trying to shame open-air preaching? Was he an atheist in disguise? Neither! He showed me his phone and there were over 300 people watching the video live. People were commenting and praising God in the comments feed. I stood astonished as the numbers continued to climb. Another brother, Ryan, who I had recently connected with and was out there with us started watching on his phone and kept telling me how many people were viewing the livestream. "Who is this guy", I thought to myself. Why were so many people suddenly viewing a livestream of my son reading Scripture? We had streamed before and the number of watchers wasn't even a tenth of the ones who started watching his within the first few seconds. As Solomon read the others who had accompanied this man were saying "Amen", "Praise God", etc. There was no opposition from them or those viewing the livestream. I didn't know what was happening but silently prayed. When Solomon finished reading the man asked if he could interview him for a few moments. "Uh oh", I thought. "This is where the other shoes drops and we find out his real motives". I agreed and Solomon proceeded to give him some great answers as to why we were out there and what we were doing. Then this man asked if he could pray for Solomon. After praying he told us that he also preached on the streets and was from Chicago. He was invited by a local church to come out and speak. They were walking around the farmer's market handing out flyers for their service that evening. I was handed one and thanked them while placing it in my pocket. Both he and his friends were very encouraging to Solomon telling him of how much his boldness was a blessing to them. "If you want to look at that video", he said, "my name is Marcus Rogers. Just type it into Facebook and you'll see it come up, man." Wait? That name sounded familiar. Why does his name sounds familiar? He thanked us for being out there and they walked away. He continued the livestream on his page talking about how encouraging it was to see a young man doing what Solomon had done. I immediately turned to Ryan and asked "Why do I know that name?" He said he it was oddly familiar to him as well. We both opened Google on our phones and started searching. The very first thing that popped on my search was link to YouTube. I opened it and scrolled to see a video on Alpha Omega's YouTube page Dr. James White was responding to this man was challenging him on the Trinity!!!! Oh no!!!! Now I knew why I recognized his name. He was a professing modalist who denies the Trinity and has challenged the teachings of James White and many other brethren for holding to this biblical doctrine. Marcus was called out on Apologia Studios podcast and videos. He was called out by James White himself and many others. Dr. White and Jeff Durbin both asked him to come on their shows to discuss and debate the topic and he refused. Here was a known heretic (and yes, modalism is HERESY) that others had tried to debate face-to-face but could not get him to do so and I didn't even know it. Ryan and I both looked up from our phones but his group had already disappeared. I couldn't believe the opportunity that was just placed before me and I completely missed it? Or did I? Since the live stream and up to the writing of this blog, the video has been shared 456 times and viewed over 30,000 times with 1,238 comments (not counting the replies to comments). The video went viral on his page. If that were not enough, my wife even told me today that she was approached by a teenager in the store this past week when she was with my oldest son Elijah. This teen apparently recognized Elijah from our outreaches at the Farmer's Market. He attended a local church and said their Pastor showed the congregation the video one morning as part of his sermon on evangelism encouraging them to share the Gospel themselves. "That video has gone viral", he told her. Viral? A heretic's video of my son reading Scripture went viral? That's when it dawned on me...we didn't miss a chance at all. I may not have refuted Marcus' heresy and called him to repentance individually but God was using the acts of a heretic to get the reading of His Word out to others. Some of the people who were watching the video from where others had shared it may not have known Marcus from any other stranger on the street, just as we didn't. The teen who spoke to my wife didn't even mention Marcus, only that Solomon was reading Scripture aloud in the open-air. That day God used someone who denies His triune nature and preaches false doctrine to bring His Word to the ears of tens of thousands of people. I trust in God's sovereignty, as described in this verse, that His Word went forth that day and continues to even now to accomplish that for which it was ordained. Below is the video in its entirety. Because I do not want to contribute internet traffic to Marcus' Facebook feed, I found a way to download it directly so I could share it with you here.